An international symposium on marine engineering technologies was held in Yantai, East China's Shandong province on June 7. Some 100 experts from China, United States, Ukraine, Norway, Sweden, Germany and other countries took apart and held an in-depth discussion on how to upgrade marine engineering technologies and to further promote global cooperation in marine projects. 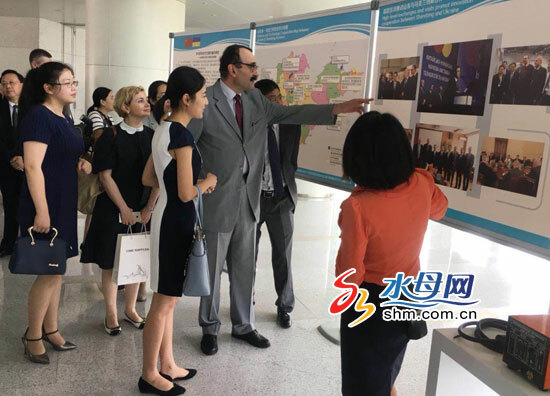 The symposium was jointly sponsored by the Department of Science and Technology of Shandong Province and supported by the Ministry of Science and Technology. Zhang Yongxia, mayor of Yantai city, gave a welcome speech at the opening ceremony. "The symposium provides a platform for countries to cooperate in marine engineering equipment and also a bridge to promote international talent exchanges." Deputy Minister of Education and Science of Ukraine, Maxim Strikha, said that the marine equipment industry is one of the key areas of technological cooperation between China and Ukraine. The symposium will play an important role in promoting mutual exchange and cooperation. The coastal city hosted the event for the first time and will also become the permanent site. Yantai city has great advantages in developing high-end marine equipment manufacturing. The Blue Whale 1, the ultra-deep semi-submersible drilling rig developed by Yantai CIMC Raffles Offshore Co conducted successful tests in the South China Sea in May 2017. Jereh Group, based in Yantai city, has become the world's largest manufacturer of oilfield production equipment. These companies have contributed to the rapid development of the city's marine industries and also helped to promote more international cooperation.Yantai has cooperated with Ukraine and jointly built a welding technology research center. Furthermore, the city will explore more technological cooperation opportunities with countries and regions along the Belt and Road and make efforts to facilitate the signing of an agreement for the Arctic offshore drilling complex project with Russia.